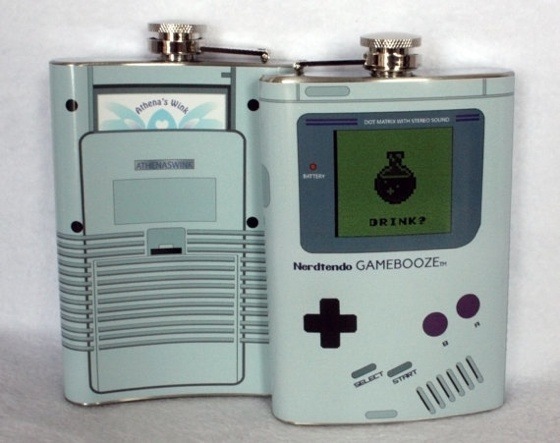 It turns out the gameboy is old enough to have a drink. Or two or three. The Gameboy was launched in 1989, making it old enough to have a few rounds in pretty much any bar on the planet. And given the treatment it got at the merciless hands of kids around the globe, I expect it’ll need more than a few to recover from all the trauma. If you’d like to grab your own flask, make sure to check out this etsy listing for your very own. And if you’re an adventure time fan, you can also get a BMO (Beemo) flask while you’re at it! This is a pre order, this item will ship in some time around August 5th. Sorry we’ve been kinda swamped with orders. This is a high quality stainless steel flask wrapped in high quality vinyl with super-strong adhesive that attaches all the way around the flask. These are actually product images and not a photoshop. Come play drinking games with me! Note: If you want me to change ANYTHING on the art for the flask it will be an extra $5 fee, you must provide any additional art and it will take an extra 2-3 weeks.